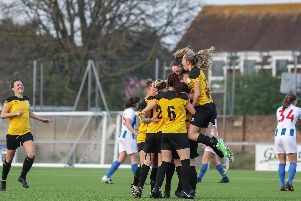 The Lions roared back from their opening-day 4-3 defeat at Eastbourne United as they took Worthing United apart 5-1 at Nyetimber Lane in the Southern Combination premier. As early as the first minute, Scott Murfin and Kieron Pamment combined to test Frazer Trigwellin United’s goal. At the other end Chamal Fenelon’s cross was just caught by James Binfield before a shot from Mark Goldson whistled past Binfield’s post. Ryan Davidson picked up the Lions’ first booking, an accidental handball being punished. With less than a quarter of an hour gone, the Lions got their opener, Ruben French latching on to a Pamment free-kick. An audacious chip from Scott Murfin sailed over Trigwell but also over the bar. Pagham thought they had a second on 21 minutes, but the offside flag robbed Pamment. Fenelon sent a header just wide of the mark before youngster George Bingham got Pagham’s second with a deflected shot just after the half-hour. The visitors had flashes of inspiration but Matt Hards’ soft shot went over the bar on 39 minutes. Within a minute of the restart, it was 3-0. Fenelon was forced to give the ball away by Ryan Davidson and Pamment took the opportunity to strike home. Trigwell almost gifted the Lions a fourth, spilling a Ryan Morey shot, but no-one was there to follow up. Scott Murfin put Morey through but the ball was hacked away. A booking for Liam Humphreys was followed by a woeful United free-kick from Fenelon, who almost made amends a few minutes later, smacking the ball across goal. Morey could feel hard done by on 70 minutes as what initially looked like a nailed-on penalty claim was turned down. Pagham boss Mark Bennett was so incensed he had to be spoken to by the referee. Humphreys increased the Lions’ lead by two goals in as many minutes. A 73rd-minute strike was followed by another on 75 following on from good work by Morey. Tommy Block’s industry in midfield was at the root of many of Pagham’s best moves. On 87 minutes came a consolation for the visitors by Calum Wells. PAGHAM: Binfield, Wiggens, French, N Murfin, Davidson, Humphreys, Bingham (Mepham 74), Kempson (Block 74), Pamment, S Murfin, Morey. Subs: A Brown, R Brown, Van Driel.